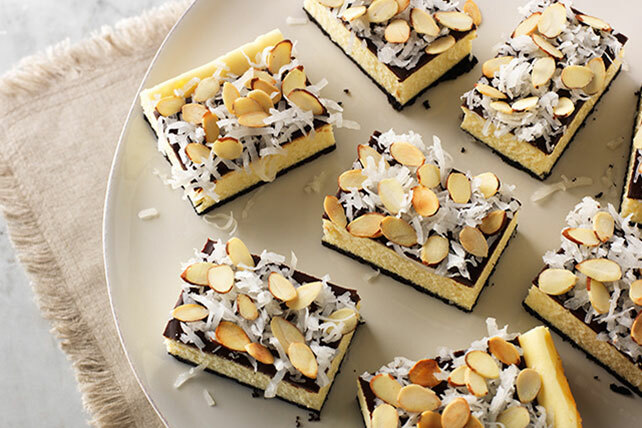 Make these Coconut Joy Cheesecake Bars that taste like your favorite candy bar. Coconut Joy Cheesecake Bars are a great treat for your next party. Line 13x9-inch pan with foil, with ends of foil extending over sides. Combine cookie crumbs, 2 Tbsp. sugar and butter. Press onto bottom of prepared pan. Beat cream cheese and 1 cup sugar in large bowl with mixer until blended. Add vanilla; mix well. Gradually beat in milk until blended. Add eggs, 1 at a time, mixing on low speed after each just until blended. Pour over crust. Bake 45 min. or until center is almost set. Cool completely. Refrigerate cheesecake 4 hours. Microwave semi-sweet chocolate and COOL WHIP in microwaveable bowl on HIGH 1 min. ; whisk until chocolate is completely melted and mixture is well blended. Pour over cheesecake; top with coconut and nuts. Prepare with PHILADELPHIA Neufchatel Cheese and COOL WHIP LITE Whipped Topping.